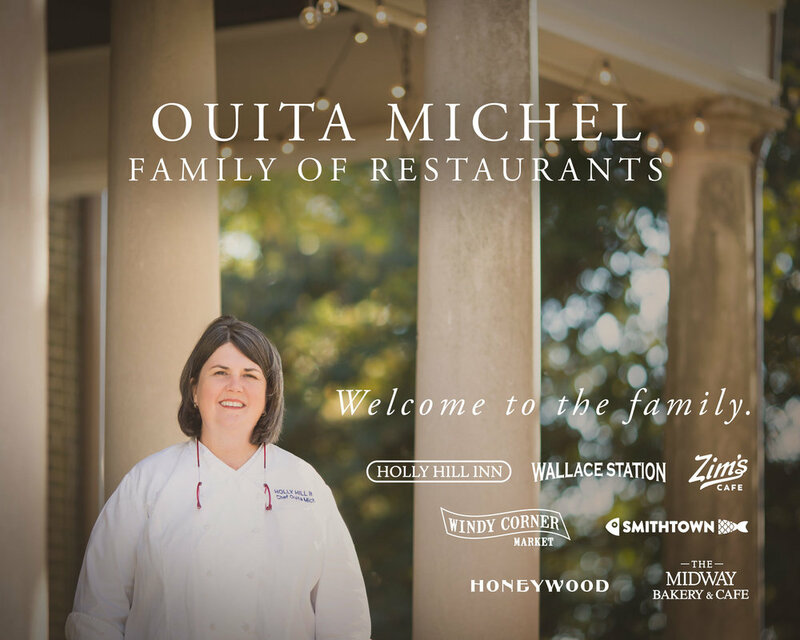 Fresh, seasonal ingredients from local farmers are at the heart of Ouita Michel’s menus at her flagship Holly Hill Inn, a fine-dining restaurant in America's Bluegrass horse country and near the Kentucky Bourbon Trail. Guests will enjoy a prix fixe menu at dinner that reflects the best of seasonal Kentucky ingredients. Weekend three-course brunch is the ultimate Kentucky breakfast experience. The bar service includes more than 50 bourbons and an award-winning wine list. Wallace Station, just outside Midway in the heart of Bluegrass horse country and near the Kentucky Bourbon Trail, is a scenic stop for homemade sandwiches, soups, salads, an irresistible bakery case and breakfast. Featured on Food Network’s “Diners, Drive-ins and Dives” and The Cooking Channel’s “Best Thing I Ever Ate.” Open 7 days a week. The Midway Bakery and Cafe creates cookies, pies, scones and more from scratch with real butter and natural ingredients using traditional recipes. Our flours come from Weisenberger Mill down the road; most of the corn and wheat is raised right here in Kentucky. Our chocolate and cocoa powder comes from Ruth Hunt Candies in Mount Sterling. Our pecans are from the Kentucky Nut Corp. in Hickman, Ky. Open 7 days a week. Smithtown Seafood is in the Bread Box building on West Sixth Street in Lexington's hot Jefferson Street corridor, and at The Summit at Fritz Farm. We make everything on the menu from scratch and, whenever possible, with locally raised ingredients. Our menu is both familiar and creative, emphasizing local foods and old-fashioned Kentucky recipes in dishes such as Beer Cheese with West Sixth Brewing Co.'s Smithtown Porter and fried Kentucky Proud catfish, flavorful salads and ethnic seafood dishes, vegetarian specialties and much more. The West Sixth location also offers burgers. Honeywood is Ouita Michel’s largest restaurant, with table service, a stylish bar and food that is fresh, locally sourced when possible, and creatively prepared but with a strong nod to Kentucky’s food traditions. Inside Honeywood, locally crafted reclaimed-wood tabletops and wood floors are juxtaposed with soaring windows. “As with all our restaurants, we want our neighbors to feel a true sense of welcome and to know how grateful we are for their support,” Michel said. Honeywood, at The Summit at Fritz Farm in Lexington, was recently mentioned in the Zagat Guide article, "30 Most Exciting Food Cities in America 2017," Washington Post and The New York Times. Open 7 days a week. "For me, while studying French and Italian cuisine, I realized they use local agricultural artisan products in their food. And that's why it's so good. That's why from the beginning of wanting to be a chef, I've committed to supporting local agriculture." She and her husband, Chris, bought the Holly Hill Inn in 2000 and opened the fine dining restaurant in May 2001. Michel’s use of locally sourced foods both helps sustain Bluegrass family farms and provides her customers only the freshest, best-tasting fine cuisine. The devotion to local foods is evident also at her other restaurants: Wallace Station Deli just outside Midway; Windy Corner Market and Restaurant and Smithtown Seafood, in Lexington; The Midway Bakery, Midway; and Woodford Reserve Distillery outside Versailles, Ky., where Michel is chef-in-residence and operates Glenn’s Creek Café and Glenn’s Creek Catering. Honeywood and Smithtown at the Summit, opened in 2017 at the Summit at Fritz Farm development in Lexington. In November 2018, Michel opened her eighth restaurant and bar, Zim’s Cafe and The Thirsty Fox, in downtown Lexington’s beautifully renovated courthouse. Her restaurants have purchased $3 million of Kentucky-grown meats, dairy products, fruits and vegetables over the last 18 years. Her reputation and commitment to sustainability have earned speaking invitations and awards from local, regional and national organizations. Michel’s work earns accolades from local and national fans of her cuisine. She has been a James Beard Foundation Award nominee as Outstanding Restaurateur and as Best Chef Southeast numerous times, competing against chefs in major metropolitan areas. Michel is an alumna of the James Beard Chefs Boot Camp for Policy and Change, a collaborative for chefs who work to improve the world’s food systems. Michel and her restaurants are regularly featured in local and national media, such as The New York Times, Southern Living, Garden & Gun, Food Network and Cooking Channel. She was a guest judge on Bravo’s Top Chef series. Active in her community, Ouita Michel is a member of Slow Food USA; Les Dames d’Escoffier; free community supper programs coordinator for Midway Christian Church; board member of FoodChain, a non-profit food incubator in Lexington, Ky., and founder of FEAST, a fund raiser for FoodChain that celebrates women chefs; board member of Hindman Settlement School, which is dedicated to enriching Central Appalachian culture; and is a member of the Prichard Committee for Academic Excellence, a statewide citizens group working to improve education for Kentuckians. Recent honors include the Fayette Alliance Agricultural Excellence Award and the Bluegrass Tomorrow Josephine Abercrombie Award, the group’s most prestigious honor, given to a person who contributes tirelessly to improve quality of life in the Bluegrass. She, Chris and their daughter, Willa, live in a 200-year-old cabin adjacent to the Holly Hill Inn. For media inquiries, call Genie at 859.846.4732 or send a message using the form on the right. For all other inquiries, please send a message using the form on the right.